Kataragama devotees pause to smash coconut offerings before the Ruhunu Kataragama Devalaya. 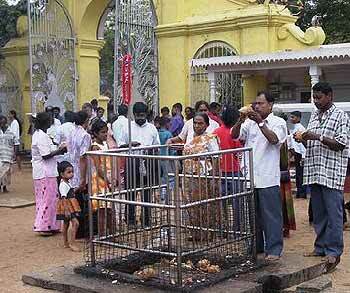 After weeks of penance, men and women devotees of Kataragama are able to walk upon hot coals without burning their feet. Kataragama is one of Sri Lanka's 16 principal places of Buddhist pilgrimage, and is also an important shrine for other religions - the Kataragama God predates the Buddha of 2500 years ago, and was originally inherited (in some form) from the indigenous Vedda forest dwellers. To complicate things further, there's a Muslim shrine tucked amongst the foliage, and the Tamil Hindus revere the site as the home of their own warrior God, Skanda.  The Kataragama Devotees Trust website is brilliant for information on all of this. Festival time in July each year is when things really hot up, and the jungle transforms under the weight of serious religious frenzy. The festivities begin on the first night with a flag-hoisting ceremony. 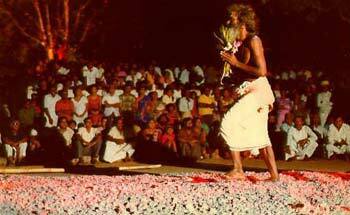 Each following night, after the ritual puja, white-clad kapurala shaman-priests perform a complex, carefully choreographed ritual in which the Kataragama God is depicted as emerging from his Maha Devale residence. He then rides in a grand torchlit procession upon a beautifully-decorated elephant to visit his sweetheart, the jungle princess Valli, and returns without being seen. Meanwhile, during this performance, hundreds of devotees, dressed in their dhotis and ceremonial markings, turn up with huge earthenware vessels on their heads. Constant shouts of 'Haro Hara' remind everyone of their presence. The holy ash and camphor inside these pots is carefully emptied out onto the floor outside the temples, for them to roll across (and to be washed off later). The area in front of the main temple is cleared and laboriously covered in a layer of burning tamarind firewood (about 2O feet square). At about 4 am when the fire walkers' river ablutions are complete, hundreds of cleansed pilgrims slowly make their way, barefoot, across the burning ash. No one is burned. Things get even more colourful on the last night of the festival - the night of the full moon. This ends with the "water-cutting" ceremony, which is enacted the morning after the Maha Perahera. The holy casket (believed to contain the secret of the God's birth) is dipped in the Manik Ganga sacred river, followed by thousands of pilgrims who submerge themselves with their arms raised and to the shouts of 'Haro Hara'. If you're planning to attend this awesome festival, it's best to plan well in advance, do plenty of research, and to liase with local authorities. Recent political unrest in the country has made travelling unwise at times, so it's best to make sure that things are calm.